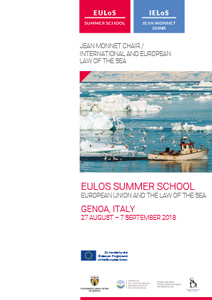 The full programme of the EULoS summer school has now been released. 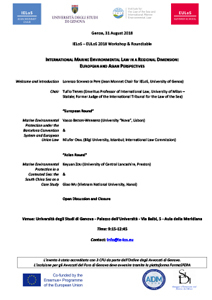 The flyer of the EULoS workshop on regional approaches to marine environmental protection has now been released. The programme will also include a study visit to the Italian Navy’s Hydrographic Institute (based in Genoa) and other exciting activities that will be revealed soon. With regard to the four modules, each of them will be covered during two days of lectures, after which a practical activity (group work) will be held to test the knowledge and the skills acquired. With regard to module 4, which will also include an open roundtable on a topical issue, the group work shall be replaced by a practical activity to be carried out at the premises of the Italian Navy’s Hydrographic Institute. Please note that the above list of subjects is subject to amendments until confirmed as final.